We are thrilled to post the final piece of work by Ethne Papenfus. Ehtne has been working on our Online Art Course Coloured Pencils. Ethne has written the following and we wish her the very best of luck with her future coloured pencil work. 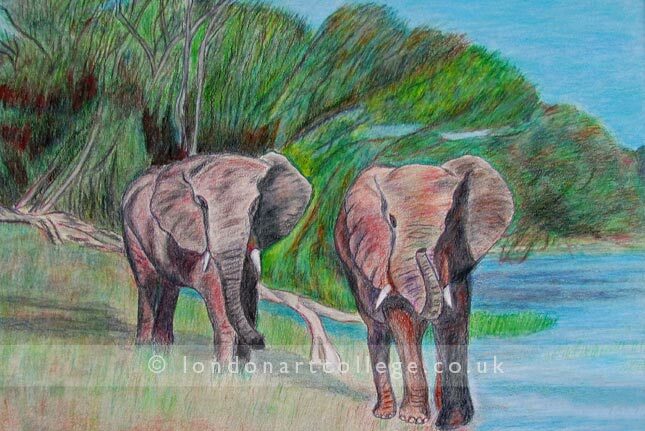 “The reference photo for the drawing below was taken in the Chobe National Park in Botswana. I worked closely to the photo, but softened the distracting floating tree branch near the far bank. Also the bare and very dominant tree trunks in the forefront of the trees. With that I come to the end of my online art course coloured pencils and enjoyed it immensely. I have taken a long time to complete it, and appreciate the extension of time given by The London Art College. I came to the course with no earlier art background, so it has been a learning curve all the way. That I have been able to sell a few works as I’ve continued with the course has been reassuring in itself. Not about to retire on the proceeds, but pleasing to see that someone else thought a piece of my work worth buying. Need to add that I only work from my own photos, so am in no danger of infringing on any copyright. On the whole, however, I don’t easily part with my paintings. Having spent so much time on them I tend to keep most of them! 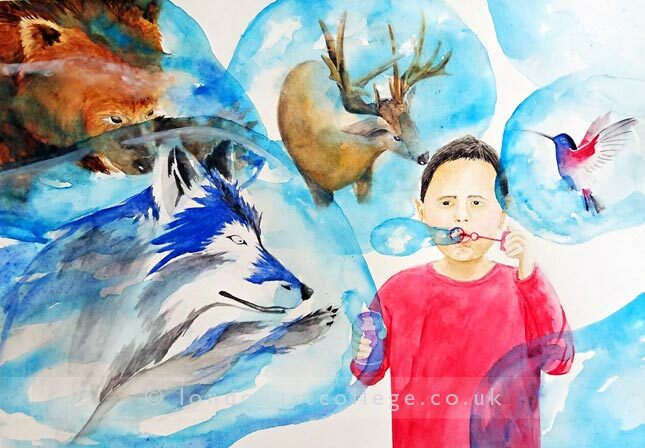 Todays post and artwork is by student Drew STH who is studying on the Watercolour Online Art Diploma Course. 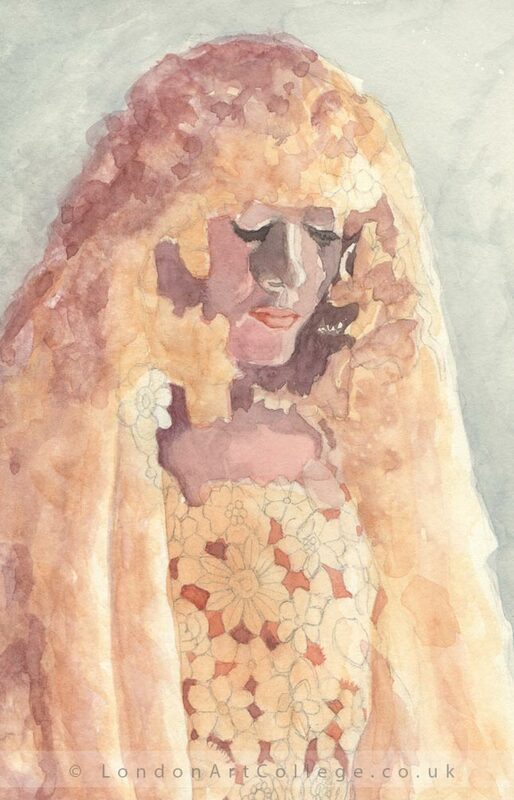 Today’s blog post displays the most beautiful watercolour painting by Ingrid Rugel. Ingrid is studying the Portrait Painting Online Art Course, tutored by portrait artist Alan Dedman. 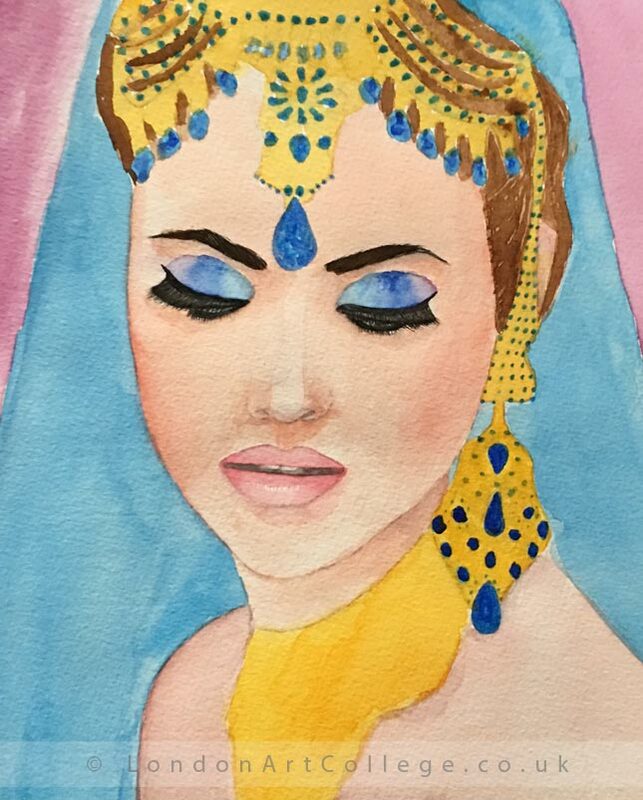 We absolutely love this painting Ingrid has created. From the lovely wet in wet washes and their delicate tones to the subtle colours she has used. Therefore, we just simply say to Ingrid…congratulations on a wonderful painting! 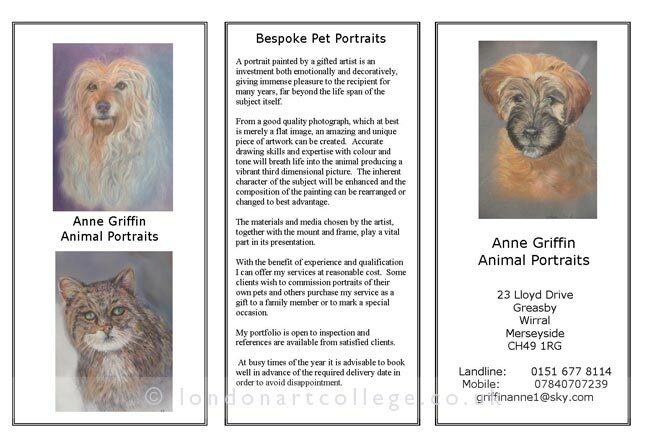 Todays blog post has been written by Student Anne Griffin – Pet Portrait Art Course. We hope that you enjoy reading Annes experiences and viewing her wonderful artwork. We wish Anne all the best for her future paintings and drawings. I am London Art College student Anne Griffin. A good friend and I were discussing one day where our art was taking us and we decided to enrol together with the London Art College on the Pet Portrait Diploma course. What an great idea this was. We found it a lot more challenging than we expected but were able to support each other through all the periods of self doubt in producing our work and submitting it for assessment. Our tutor Gayle Mason was excellent in judging our strengths and weaknesses. She pushed us into a much higher standard than we dreamt we could achieve. Gayle did not miss anything in her critiques – even a misplaced whisker. She was also generous in her praise and whilst we suffered agonies over every submission we always felt she had made a very good assessment. Gayle was very generous with her time and in sharing her knowledge and made us feel that our success was her success as well. She has given us the benefit of her experience in promoting ourselves for commissions and instilled a sense of self worth and belief in our ability. 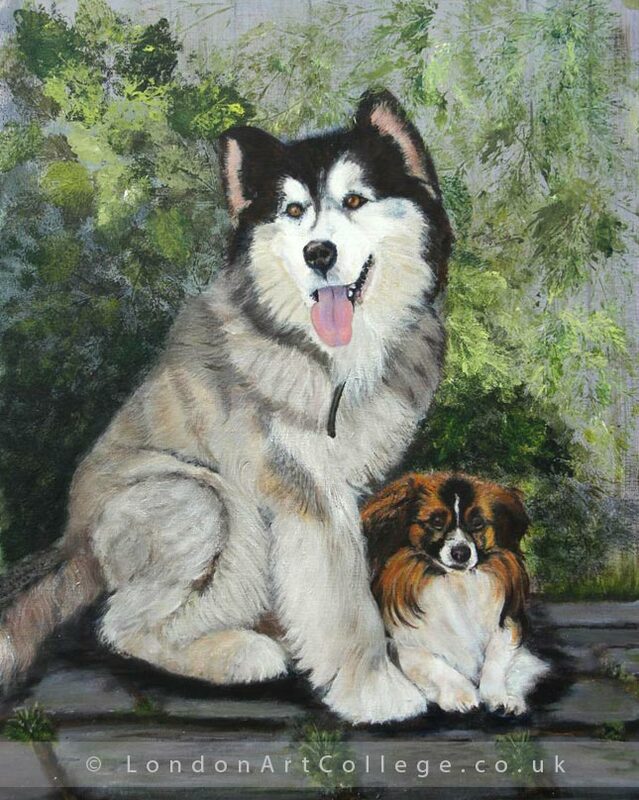 Our final submission was a mock commission for a painting of two dogs. We had to produce an advertising pamphlet and a client brief in the form of a letter. The masthead to be of our own design detailing the client’s requirements. It needed to offer advice and recommendations as to the most suitable medium and composition; sketches were required for this purpose. The two dogs I chose were from my own reference photos taken in two different places while on a motorcycling tour in Northern Spain the previous year. They were from different areas and different breeds. I was inspired to place them in such a way as to show a close bond and take advantage of their different sizes to try to create a protective feeling in the larger dog over the smaller. I think this worked well and the closeness was enhanced by the background of foliage against a fence in close proximity. There were many challenges in scale and detail but I gave it my best shot and awaited my results with trepidation. You can imagine my delight to find that I had been awarded a distinction, as had my friend for her submission. Gayle taught me to be ultra observant, to measure scale accurately, to check tone against a greyscale. She also encouraged me to take short breaks, reconsider and correct where necessary, and never to be satisfied until I could give no more. I will always strive for this level of commitment, and work through problems to achieve a standard of excellence. I have seen this standard in Gayle’s own artwork and she is inspiring me now to tackle wildlife as well as domestic pets, using the skills she has instilled in me. We worked hard to finish the course well within the time limit and set our own schedule to do so. This helped us keep focussed and allowed us a margin of time at the end should it have been necessary. From my own experience I cannot recommend highly enough the course content. It was structured to take the student in measured steps towards the final skills required. This was even more apparent in hindsight when I looked back through my portfolio and submissions. Thank you London Art College and a special thank you to Gayle Mason. 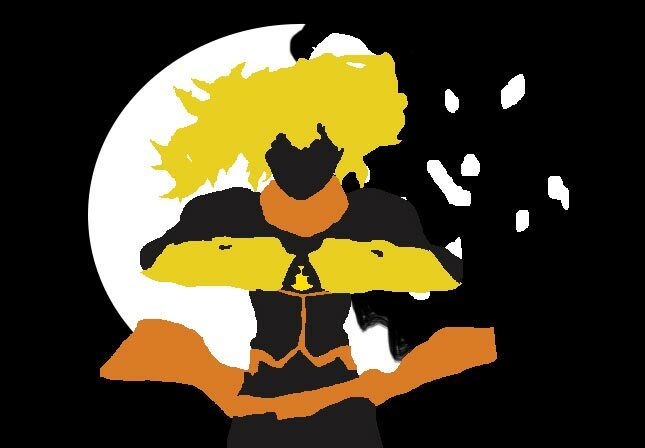 My name is Chloe White and I’m studying the Digital Illustration Online Art Course with tutor Spencer Hill, whilst working full time, primarily specialising in creating illustrations based on photographs or sketches. 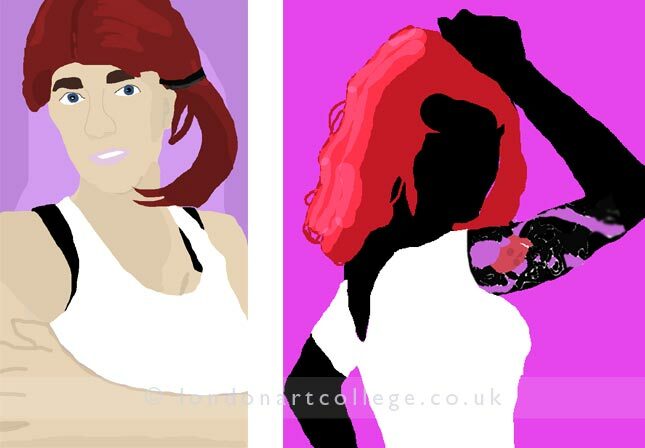 These three illustrations were based on photographs taken and then heavily edited to achieve different effects. The first being an exercise in the different facial features held by the different genders, the second including more fantasy elements, and the third having a punk theme. The main theme of all of these illustrations is the different personalities that can be captured in art depending on the colour scheme used. Have you entered our competition yet? The deadline is only a few days away. 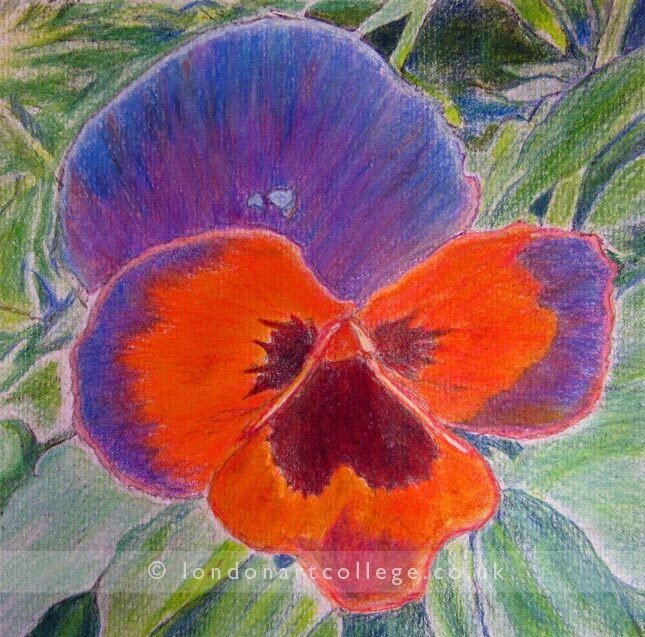 Enter any painting or drawing you have created with a chance to win either £200 or £100…..
Today’s post is by Ethne Papenfus who has nearly completed our online Coloured Pencil Course with us here at the London Art College. Ethne said about her Pansy drawing…. “I enjoyed doing this painting. Pansies give such a wonderful show of colour in the garden each year. Softened the back greens a little, to keep the emphasis on the flower. In Afrikaans a pansy is called a ‘gesigie’, which means ‘little face’. This pansy really seems to live up to that. The size of this drawing is A4. I usually work on A3, however for this subject the A4 seemed preferable. The paper I used is Creativ Artist Paper. Nice paper to work with, with a fairly heavy tooth. I used mostly Prismacolor, Premier, Verithin, and, to a lesser extent, Art Stix coloured pencils for this piece. Also Caran D’Ache Pablo, which is a lovely soft pencil. I also used Faber Castel Eco and Derwent. Veterinarian, Lynne Faulconbridge, has just completed her online art course at the London Art College in Pet Portraits. It is tutored by professional pet portraits artist and tutor Gale Mason. 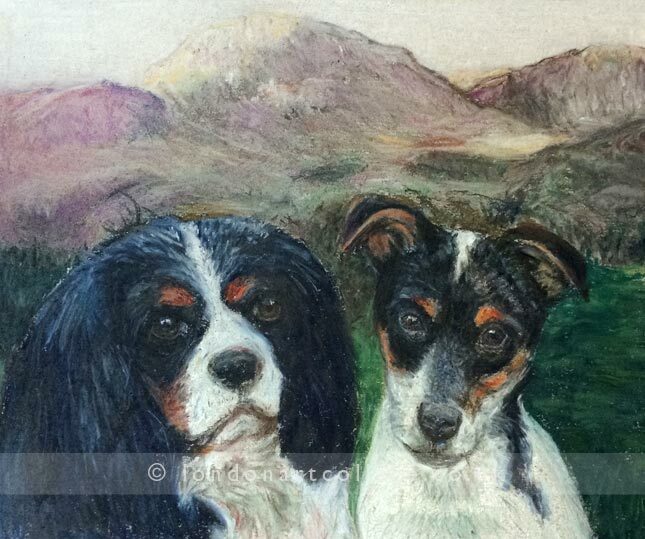 Lynne’s final painting for the course is of two dogs in a landscape painted using pastels. Lynne sent the following testimonial to Gayle when she had completed the final set of work. We are thrilled that Lynne enjoyed her course! My final painting is in Pastel, which is the medium I have enjoyed most throughout the course. I have learnt to use Paintshop Pro to create a composite photo to form the basis of the portrait. It is a challenge to depict paint shopped dogs realistically on a background. Particularly getting scale and outlines right. I hope it has worked ok! Thank you for supporting me along the course and for your detailed critiques – it has been enjoyable and I will miss it! Lynne also sent another email when she started the course. Consequently it’s always great to receive feedback about our courses, in addition, to find out what our students hope to achieve during the course. Now Lynne has completed our Pet Portraits Diploma, she is ready to start taking commissions for pet portraits. I think the course so far has been pitched perfectly. Going over basics to help refresh skills and being demanding enough to stimulate interest. I feel I have pushed myself more than I have previously to explore pencils beyond 6B softness and achieve better contrast in black and white. I’ve taken this course as an incentive to get drawing and painting after a long gap. I’m a vet and I am lucky enough to see animals every day. I hope to become competent at animal portraits, enjoy myself. Maybe accept commissions one day, if my work is of sufficient quality. Are you are interested in becoming a pet portrait artist? Perhaps you wish to develop your animal drawings and painting further. 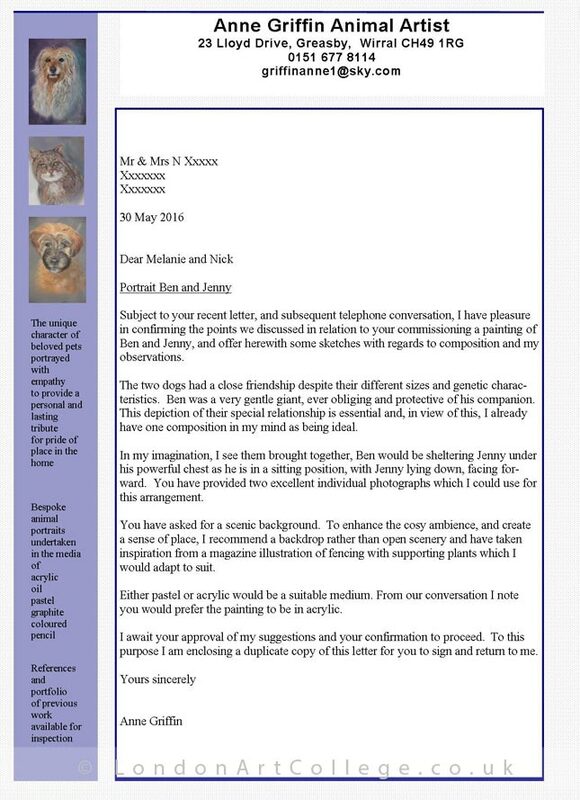 If so, our Pet Portraits Diploma is for you. 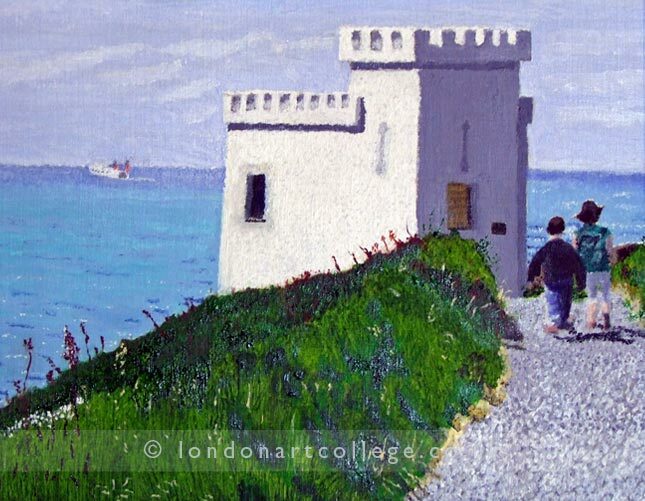 Prospective students can enroll on our website London Art College Online Art Courses. Start your course at any time and work around your daily job, just like Lynne has. Lisa Chaffrey is currently working through our Drawing and Painting Online Art Course. Furthermore she is being guided by tutor Paul Weaver, who is also an excellent and very friendly professional artists and tutor. Paul has been helping Lisa with her drawing and painting skills. In the paintings below Lisa has been studying portraits in watercolour. We particularly like the first painting below, which is full of colour and movement. 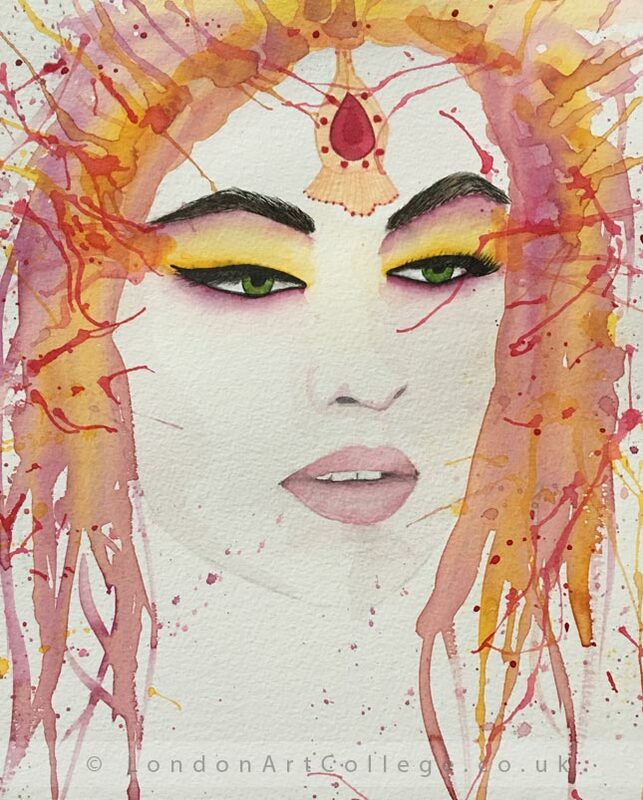 We also love the way Lisa has used the white of the watercolour paper to her advantage. As a result it has kept the painting light and airy. I just want to enjoy doing art, I hope this course will help me improve my very basic art skills and knowledge. We feel that Lisa is doing a superb job and Paul Weaver recently said about her set 5 artwork…. We would like to congratulate Lisa on two fabulous watercolour paintings, we are all looking forward to seeing Lisa final set of work for the Drawing and Painting online art course. In conclusion do you feel that you would gain by having some guidance in your drawing and painting? Do you have lots of questions you wish you could ask a professional artist? Why not enroll onto our most popular course today with the London Art College, the Drawing and painting online art course. Most of all study from the comfort of your own home and work the course around your family life and work schedule with ease. 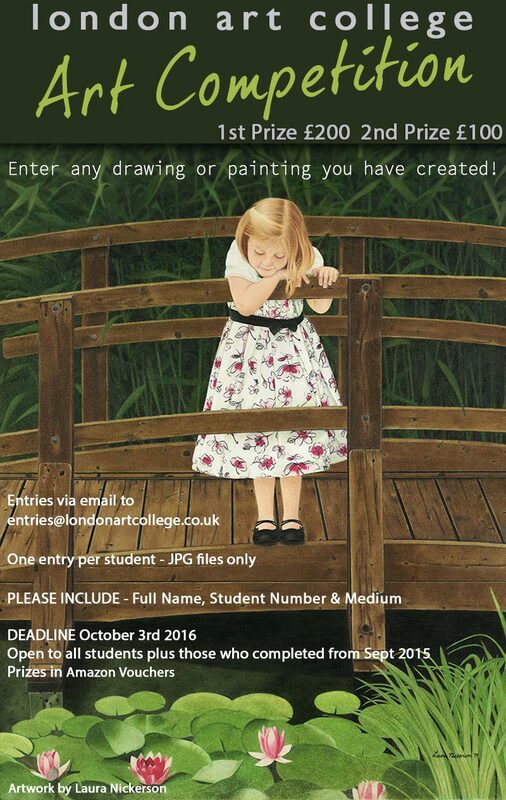 Visit the London Art College website for more information. 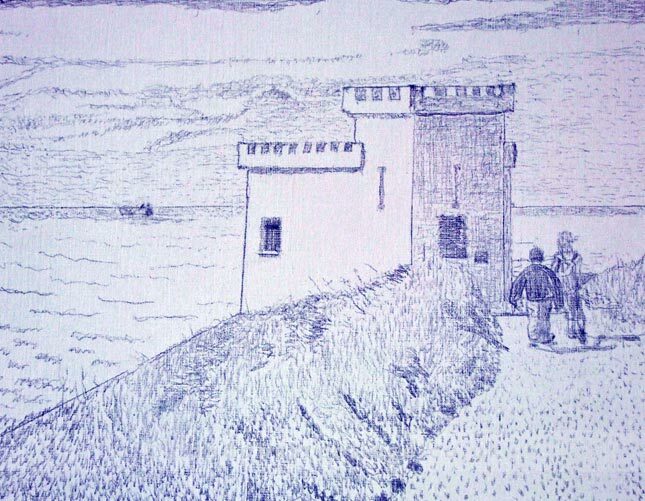 “Making a detailed drawing helped me to paint the tower with ease. I tried to paint dark to light most of the time. Working on different areas of the painting to allow the painting to dry if necessary. For instance, I used Ivory black to paint small dots over the walls and castellation of the tower. I allowed it to dry before over painting it with white. I used Phthalo green to under paint the sea before allowing it to dry and painting with King’s blue mixed with Zinc white to over paint the Phthalo green. Whilst wet, I over painted the King’s blue with Prussian blue for the low lights and Titanium white for the high lights. I was very pleased with how easy the sky was to paint, as compared with water colour. Using Ivory black with a hint French Ultramarine and Zinc white to get the dark grey low lights on the tower as it seemed to reflect the sea which surrounds it. I was very pleased with the overall effect, but felt I could have over painted the lower turret with Titanium white to make the shadow on the castellation even lighter. I decided against it in the end – Artistic licence! If I was really picky I would like to make the right hand funnel on the ferry a fraction shorter but again it was so difficult to do in the first place, I decided to leave well alone.